My Review: I liked this book – a lot! I liked it so much I’ve bought copies for several family members and friends. I liked it so much that I will not part with my own copy, but intend to keep it in my small library. 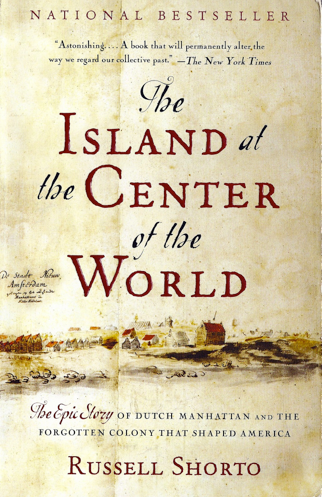 The Island at the Center of the World is the story of Dutch Manhattan and the Hudson River north to Albany. It covers the time period from the first establishment of a trading colony by the Dutch until the colony was surrendered to the British, a period of some sixty years. Having lived near the Hudson, paddled its waters and spent time in New York City the book has special meaning because there is so much that is familiar in it, yet I knew nothing of its genesis or how it still impacts my life today. For instance, I find it fascinating that Broadway was an Indian trading route before the Dutch arrived. It continues today on much of its original path. The Dutch were traders, not nation builders. They opened their doors to anyone and everyone who wanted to work and do business. This created a cosmopolitan mixture of races, religions, values and customs that generated a tolerance for and acceptance of differences that continues to this day in that great city. The fact that the Dutch were focused on business and trade rather than religion and nation building is one reason why New York became a world trading center and the state earned the title of “Empire State”. We who have grown up in the state and lived along the Hudson will recognize the familiar names of Schuyler and Van Rensselaer and be surprised at how Yonkers got its name. We all know the story of how Manhattan was purchased for $24.00 worth of trinkets, but will be surprised at the Dutch traders understanding of Indian ideas of property ownership. This allowed them to live and work peacefully side-by-side for many years. You will see how the caricature of the peg legged governor, Peter Stuyvesant, does such an injustice to the real man. You will learn how the tradesmen’s struggles to establish self-government that incorporated ideals of free trade, individual rights, and religious freedom set the tone for what would become the Thirteen Colonies and the United States Constitution. This book is extremely well written. Shorto somehow makes a great yarn out of a scholarly work on this original Dutch colony. I can’t recommend it highly enough. Note: Sometime after reading this book, my sister discovered that an ancestor on my maternal grandmother’s side was one of the Dutch settlers of Manhattan, and in fact, there is a street carrying the family name on the island to this day.